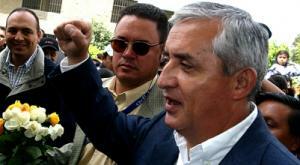 President Otto Perez Molina and his "mano duro"
Perez Molina didn't provide any more specifics of his proposal, nor did he say when the regional meeting would take place. But he did say he would discuss the subject with Salvadoran President Mauricio Funes when Funes visits Monday. Well if you think about it,legal market drug regulation is really the tool that will do the most damage to cartels if that's Molinas intent. What more "Iron fisted" plan could he use other than taking away his opponents primary source of income while still hammering away using military force? There will be an election in Mexico this year and a possible change of government could see a president there with similar views. On top of ballot initiatives and presidential hopefuls supportive of ending the drug war in the Nov US elections 2012 looks like being a year we discuss drug law reform.